The word "triskaidekaphobia" means "extreme fear of the number 13". This superstition is related to "paraskevidekatriaphobia", which means "fear of Friday the 13th". A word formed by joining together parts of existing words is called a "blend" (or, less commonly, a "portmanteau word"). Many new words enter the English language in this way. Examples are "brunch" (breakfast + lunch); "motel" (motorcar + hotel); and "guesstimate" (guess + estimate). Note that blends are not the same as compounds or compound nouns, which form when two whole words join together, for example: website, blackboard, darkroom. The word "alphabet" comes from the first two letters of the Greek alphabet: alpha, bēta. Some words exist only in plural form, for example: glasses (spectacles), binoculars, scissors, shears, tongs, gallows, trousers, jeans, pants, pyjamas (but note that clothing words often become singular when we use them as modifiers, as in "trouser pocket"). 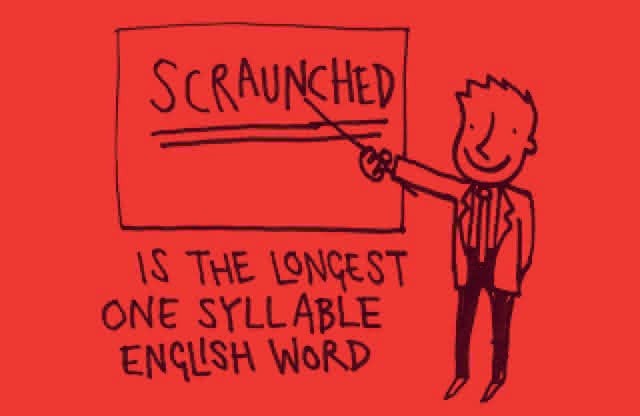 The longest English word without a true vowel (a, e, i, o or u) is "rhythm". The following sentence contains 7 identical words in a row and still makes sense. "It is true for all that that that that that that that refers to is not the same that that that that refers to." (= It is true for all that, that that "that" which that "that" refers to is not the same "that" which that "that" refers to. A sentence with a similar pattern, which may help to unravel the above, is: It is true, despite everything you say, that this word which this word refers to is not the same word which this word refers to.